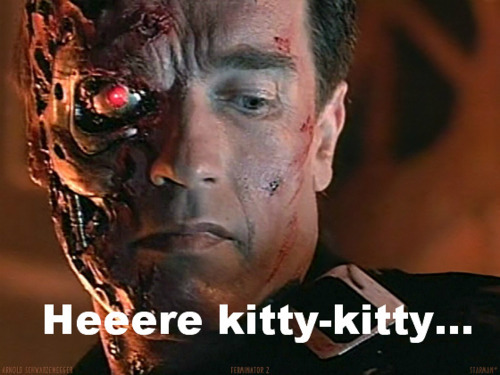 Thanks Pentagon, now Skynet's got another tool in it's belt. All kidding aside, this video shows some amazing leaps in mobile robotic technology. Once a practical portable energy source is created (if it has not yet been, where’s our Arc Reactor Mr. Stark? ), the world is going to change. Interestingly, and arguably, sadly, it looks as if that change will first come on the fields of battle. Okay, so they say this is for defense and bomb disposal, but in my mind (and I can’t lie, in my mind, this scenario looks AWESOME), I see hundreds of atomic powered Robo-cats streaming across the battlefield taking out the opposing forces in one of the most fear-inducing scenes of chrome and blood since the T-1000 pulled it’s eye out in the first “Terminator” movie. I also see a pretty interesting segue into the creation of real-life “rat things” (if you don’t know what I’m talking about, go read “Snow Crash” by Neal Stephenson and you can thank me later).